While this wildflower is unlikely to win any prizes for being a thing of beauty, it certainly could be called quite a curiosity. 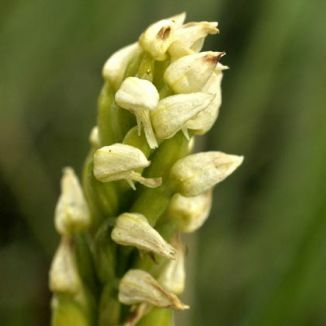 It is a self-pollinating orchid with a tightly-packed spike (2–6 cm long) of ten to thirty pale, creamy flowers – sometimes with a pinkish cast. Each of these seem to be almost closed over with only the lower, forked lip protruding from the hood formed by the sepals and upper petals. The erect stem, which reaches 20 cm, arises from two or three basal, lanceolate and, occasionally, spotted leaves. Smaller leaves hug the stem. 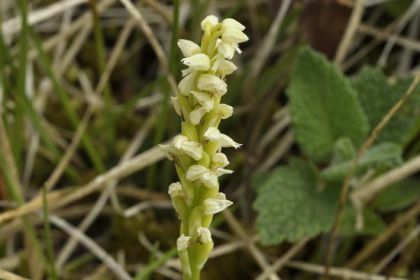 Flowering from April to June, this plant is confined to the western half of Ireland where it can be found growing on limestone pavements, dunes and short calcareous grassland. It is a native plant belonging to the Orchidaceae family. My first record of this plant was at Ballyryan, Co Clare in 2010 where I also photographed it. First recorded in Ireland in the late-nineteenth century, this orchid is more commonly found around the Mediterranean.